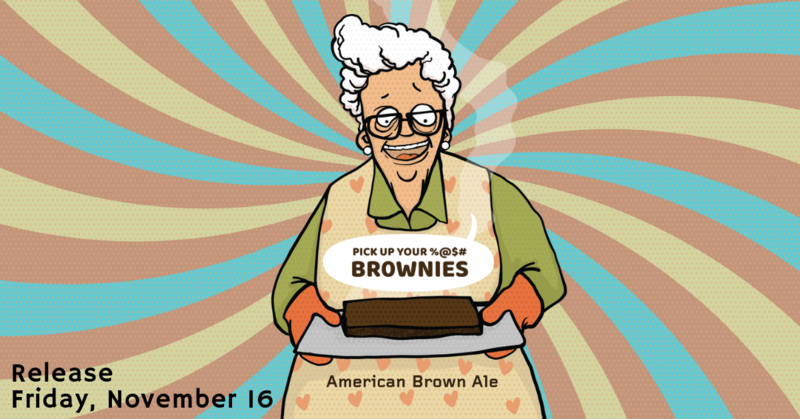 Brewday reminded us of coming home to the smell of mom’s fresh baked brownies. Ohhh what a magical feeling. This classic American Brown Ale mixes together a sprinkling of caramel and chocolate malts with a dash of Cascade and Chinook hops to create a warm comforting hug of deliciousness. Mom’s worked hard brewing this batch for you. So don’t disappoint her. Pick Up Your %@$# Brownies! Join us on Friday, November 16 starting at 2:30 p.m. for the release of this brown ale on draft or in a 16 oz. 4-pack. Phat yummies will be here for the night and Matt Miller goes on at 6:30 p.m.